Sarco wind farm has announced it has reached another successful milestone that has seen the completion of the lifting of the first of its 50 wind turbines. The wind farm is located approximately 70 km to the southeast of the city of Vallenar in the Atacama Region in northern Chile. The turbines that will be used for this project, which was developed and is being built by Mainstream Renewable Power and which is owned by Aela Energía have an individual capacity of 3.4 MW and are being supplied by SENVION. The wind turbines, which are 149m in height, can take between 1 to 3 days to lift. This is a highly complex process that must be carried out in favourable weather conditions. The components were transported over a distance of 160km from the Port of Las Losas in the city of Huasco to the project site in the commune of Freirina. 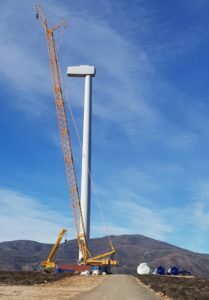 Mainstream Renewable Power’s Project Manager for Sarco Alejandro Espinoza says, “The lifting of the first turbine marks a significant milestone for the wind farm. Transporting, unloading and installing the turbines presents a significant challenge given the weight and dimensions of the different components that make up the wind turbine.” Aela Energía, the joint venture company owned 60% by private equity investor Actis and 40% by Mainstream was awarded contracts to build and operate the Sarco wind project, with a generation capacity of 170 megawatts which will supply regulated customers in Chile’s SIC electricity system. 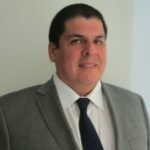 The company was awarded the 20 year contracts by the National Energy Commission (NCE) under a highly competitive bidding process which saw 31 companies compete for 1,200 gigawatt hours of energy.